in a week filled with birthdays, even births, word came on friday that my aunt thelma had died. aunt thelma was my mom’s oldest sister, the matriarch of the eaton clan after grandma died. she was a kind, compassionate lady who loved the Lord and it showed in her gentle love for everyone whose life she touched. she was 90 years old, still very much involved in life, driving herself to a doctor’s appointment when she stopped at a red-light and died. she had lived with her daughter and son-in-law for the last 14 or so years down in cape coral, florida and they will have a memorial service for her down there next saturday. at some point unknown to me presently, they will bring her ashes up to albion, il to be buried next to her husband, uncle aub. 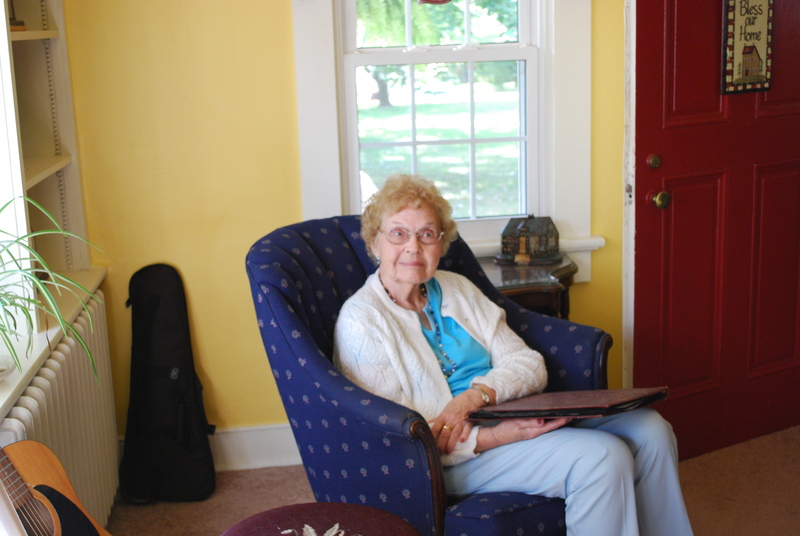 the last time i saw aunt thelma was in september, 2009, when cousin linda brought her to my house (thank-you, linda). it was the first time she’d seen sonnystone and she toured every area; we looked through some old photo albums of my mom’s; we sat on the front porch swing and gently rocked, talking until it was time to go. just in case it was the last time i saw her, i hugged her tightly and told her how very much i loved her. i only took one picture of her that day, and it’s not the best because it doesn’t show her sweet smile, but a person like aunt thelma has a radiance, almost like a halo, that shines through any expression. my heart goes out to her daughter, linda; to mo, linda’s husband; to her grandchildren, chuck and joe, and her great-grandchildren. all of us cousins are saddened, too, as well as anyone who ever knew her. i’ll bet she had quite a greeting party in heaven….